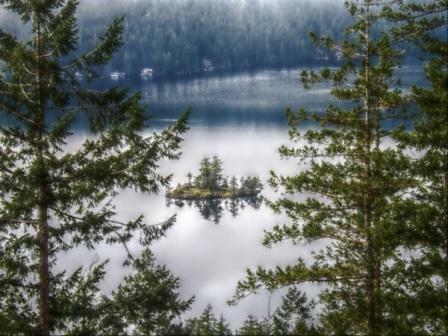 Sunshine Coast trails are located in one of the most beautiful places on earth. Really! The Sunshine Coast of British Columbia, Canada is surrounded by ocean and covered with forests, mountains and lakes. This makes for some awesome scenery. The area from Sechelt to Earl's Cove (called the Sechelt Peninsula) is almost an island, with just a narrow piece of land at Sechelt connecting it. The entire area is networked with 100's of trails and I’ve hiked, biked and mapped almost every one between Earl's Cove and Langdale. No matter whether you mountain bike or hike, you will find a trail to suit you. If you would like to get a clearer picture of the lower Sunshine Coast, click here to view a map. I have always believed that getting outside and enjoying nature has made me healthier both mentally and physically, however now science is backing me up. If you want to lower your blood pressure, fight depression, reduce back stress and maybe even prevent cancer head outside and "forest bathe" as the Japanese call it in this fascinating article written by Florence Williams for Outside Magazine online.Very, very interesting. Anyway, I hope you love and appreciate the Sunshine Coast, its trails and everything it has to offer as much as I do! I would love to know your thoughts about this page, site and/or the Sunshine Coast...so if you have a moment (and a Facebook account OR Yahoo, AOL, Hotmail) please leave a comment in the box at the bottom of this page. If you like my Site about Sunshine Coast trails, please let Google know by clicking the +1 button.